Quality Service is a mainstay with Covington Services. You can rest assured that we are well equipped to meet the needs of your specific machine requirements. All of our on-site trucks are well equipped with a wide variety of the most common parts used in the industry today. 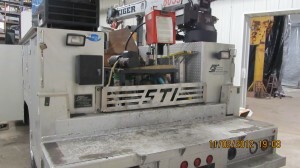 We maintain a plentiful inventory of parts to ensure we can repair your machine in a single trip when possible, saving you money and downtime. We come prepared. Covington Services offers a variety of equipment to get any job done. From cranes, forklifts, and roll-off trucks, to portable mig welders, plasma cutters, and even a portable hydraulic hose machine. We provide on-site service of any and all material handling equipment. Covington Services technicians are intensively trained and backed by two generations of experience, in addition to manufactures training when available. Our service trucks are fully stocked with the most common parts in order to solve your problem in a single trip in most cases. 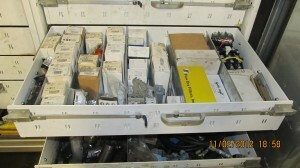 A glimpse of the array of parts our trucks are inventoried with.